Naples Philharmonic (FL) Principal Percussionist Jim Dallas visited our factory today. 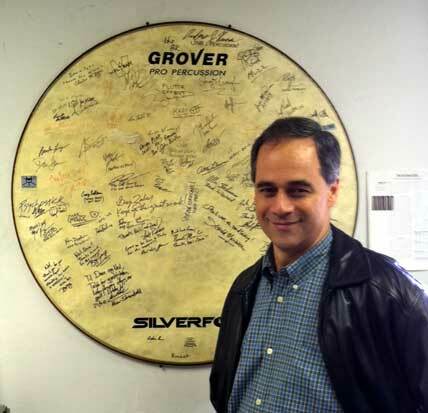 Jim was on a New England trip visiting both the venerable Avedis Zildjian Company and Grover Pro Percussion too. While he was here, Jim informed us that he really loves our new X-Series Synthetic Head Tambourines. Jim explains his experience is that our innovative synthetic head tambos work really well, and are unaffected in the very humid Florida weather. Jim purchased his first Grover Pro tambourine in 1983 and reports that he still plays it all the time with the Naples Philharmonic!